Floyd Hayes brings to our attention a window display Coke placed next to a Starbucks store on Broadway in New York City. 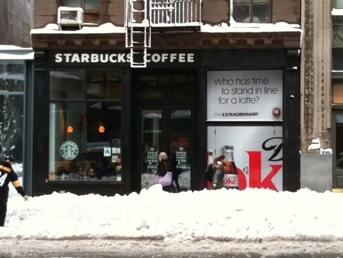 The sign reads, with images of Diet Coke, reads, "Who has time to stand in line for a latte?" We think it might be time for the employees of that Starbucks to step outside and accidentally discharge all of their whip cream canisters all over that Coke sign.